I grew up on a 150 acre farm outside McAlester, Oklahoma. My appy, Navaho Star, was out of a Star Money mare, and Navaho Britches. He loved to run, and probably could have semi held his own on a racetrack. The best place for that type of speed is a totally level soft track. Not readily available on a farm. One day while riding down the dirt road I took notice of the fenced off, not yet paved, Indian Nation Turnpike. It was just too much for a 12 year old to resist. I jumped my appy over the fence, and we raced happily back & forth until the road crew showed up, and caught us. They demanded to know where Id broken the fence. Told them I didnt, and led them back to where Star had jumped it. After laughing they told me I shouldnt do it again, and to jump back over which I did. 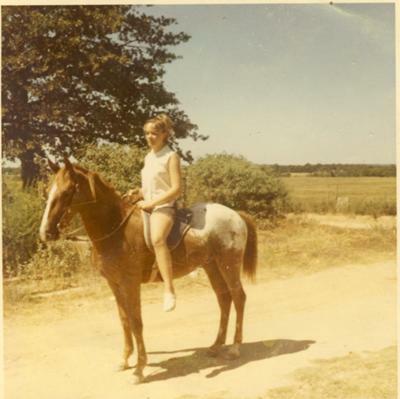 I found out accidently during a visit to my old stomping grounds 30+ years later, that old timers in that area still talk about the girl & the appaloosa racing on the turnpike. So, I guess I owe a turnpike fee that I never paid. lol. Im including a picture of the horse that made me a felon. HaHa. Here hes not quite 2.